Amazon calls these pages “errors” or “duplicates,” but the truth is that they don’t just appear from nowhere. There’s no magic involved. Someone is posting them. In my experience, this is a third-party seller or sellers, who either are doing a terrible job entering data, have errors in their data, or are outright just trying to rip people off. 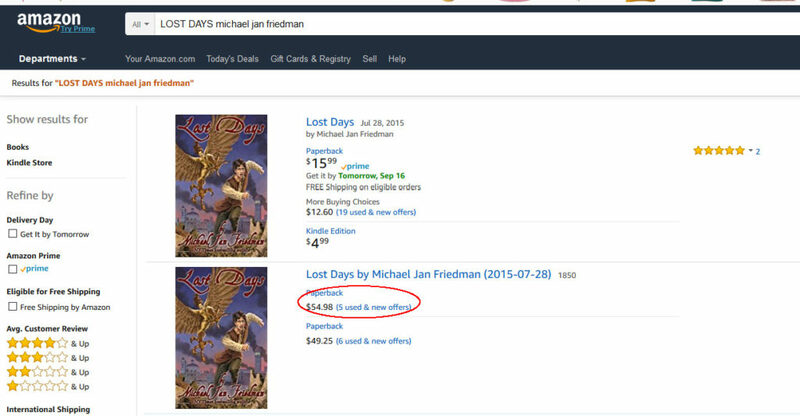 Here’s an example I just came across today: Lost Days, by Michael Jan Friedman. There are couple of things that give away the second entry as a “duplicate:” First, see the “1850” on the end of the title. You won’t find that on a legitimate posting. Second, the price. That’s a real shocker, isn’t it? Who would pay that for a used book, when the new book is just $15.99? The next clue comes when you click on the the title. You’ll find it is only sold by third parties and that there isn’t an ISBN. Just an ASIN. This indicates that this title is not linked to the original book. The prices on this one range from a low of over $50 to a high of over $80. Either these are serious errors in the sellers’ databases or Lucy, you got some ‘splaining to do! The nice thing is that if you are the publisher or author, you can notify either Createspace or Amazon of the page and they will take it down. The problematic thing is that there are so many of them. As an author, you have to go through every one of your books and check for them. Laborious, for sure, and it shouldn’t be your job, but if you want it done right, you’d better do it yourself. This entry was posted in Amazon, Self-publishing, The Business of Publishing. Bookmark the permalink.